Need help with your NRL Dream Team - NOT The Footy Show teams up with the 'Who's Playing Who?' boys to assist. Warrick Nicolson is joined by first time guests Adrian McMurray and Matt Trodden in NOT The Footy Show's NRL Dream Team Special. With mainly the NRL Dream Team game in mind, we cast our eyes over the hits and misses of DT selection, the gun rookies you have to have and list all the goalkicking options across the NRL. Check out Adrian and Matt's work on www.whosplayingwho.net and NOT The Footy Show returns with all our regulars next Wednesday night February 29th. You can watch or listen the whole show that was streamed live via a replay you can start at any time here http://www.ustream.tv/channel/not-the-footy-show or grab the edited Podcast as an MP3 (Right click, save target as). Michael Gordon wants to play ______ in 2012. On Friday night I had the opportunity to grab a quick chat with Penrith Panthers fullback Michael Gordon after the Panthers had disposed of the Parramatta Eels 26-10 in their final pre-season game of 2012. Now although I just identified Gordon as a fullback, he revealed in a honest interview that quite frankly it doesn't matter where he plays for the Panthers, he just wants to play. And you'll never guess what position he's put his hand up for just to get a run. The full interview will be on the next regular edition of NOT The Footy Show, but for all the best bits check out the full article on www.penrithpanthers.com.au or via the direct link. Also on www.penrithpanthers.com.au there is a feature on Penrith halfback Luke Walsh and he told us point blank what the Penrith game plan is under new coach Ivan Cleary. 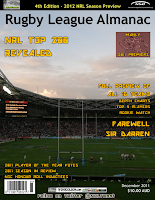 If you want a full preview of 2012 you'll need to pick yourself up a copy of the 2012 Rugby League Almanac for just $10.00 - where every team is analysed in depth and our Predicted Ladder and Premiership pick is published. Welcome to the second season of the most comprehensive and up to date NRL Injury and Suspension List available on the internet. We have once again sourced together a pre-season Injured List and will update it throughout the 2012 NRL Premiership. Our sources are Official NRL Club Sites (links available below for their official injury list), mainstream media (including the outstanding Late Mail in the Sydney Morning Herald) and our own weekly game observations. Means a player could play this coming Round but don't be shocked if they don't play due to niggling injury or recent short term injury. Means a player is extremely unlikely to play this week or next week due to long term injury/suspension, but beware players sometimes do return out of nowhere. We have added ETA (Estimated Time of Arrival - back in First Grade) for 2012 but please it is a GUIDE, not an iron clad date of return. NOTE: Players who are listed as 'DOUBTS' may have actually played the previous round but if they are still thought to be carrying an injury they will remain on the DOUBT list. This Injury List will be updated regularly during each week of the season, making it an invaluable Fantasy and Tipping Tool in 2012. But if you want game-specific Late Mail every week, then check out our Round Previews Every Wednesday and they are updated every Friday. NOT The Footy Show Episode 89 - 2012 NRL Season Preview Podcast ... We're back! Season 2012 is nearly here, so let the team at NOT The Footy Show break it down for you. With Nic McInerney, Matt Duncan, DC Chapman and Warrick Nicolson in NOT The Footy Show's NRL Season Preview Special recorded on February 5. We give our Predicted Regular Season Ladders, Top 8s, Grand Finalists and Premiers. 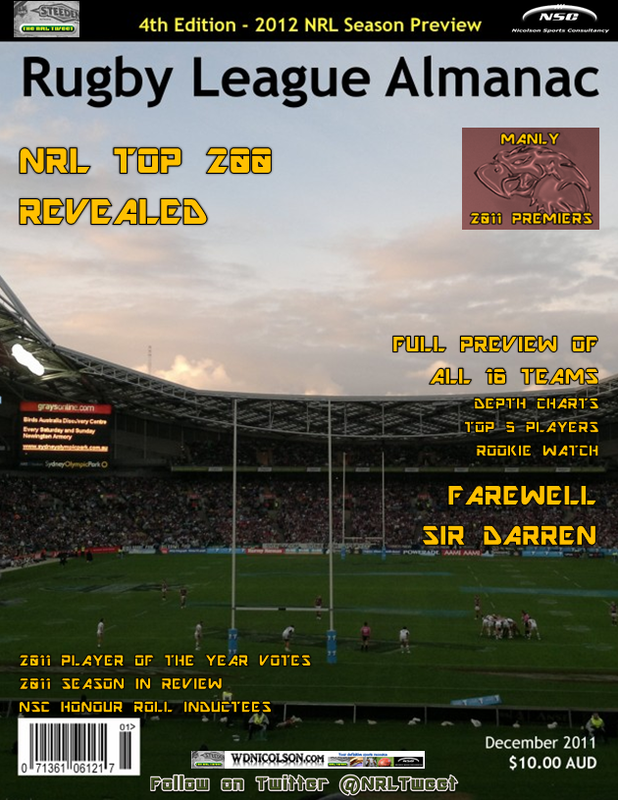 Plus all the major individual awards - Player of the Year, Top Tryscorer, Rookie of the Year, Origin Series Prediction and our personal choices for the Top 10 Players in the Game. For at least one more show. At the end of the 2011 NRL Season, NOT The Footy Show signed off for what was probably the last time. As much fun as the show was to make, the production time involved for one of us was just too big a burden to take on for another year without some sort of resolution in the offering. This meant that at the end of 2011, NOT The Footy Show was done. Then the off-season came (and went) and whispers grew that perhaps, or maybe, well actually there could be a slight hope that NOT The Footy Show would return in some form, and they would kick-off the 2012 Season with the first preview of the NRL available anywhere. Plus, it was announced on Facebook and Twitter, it would be shown LIVE. It didn't take much convincing to get Nic McInerney, Matt Duncan and DC Chapman out of what was really a forced-retirement and back into the studio for our unique take on the forthcoming Rugby League season and so they'll join me (Warrick Nicolson) this Sunday February 5 at 5pm in the studio for NOT The Footy Show streaming in live video format right here. You can watch NOT The Footy Show Live from this page or you can stream it on the Ustream dedicated channel here We're also hoping that by recording the show via the site (downside is video quality diminishes slightly) you will be able to catch the show via a replay on the same ustream page whenever you wish!